By the time this gets published I'm already en route to San Francisco (but will have 'net access when I'm up there, so keep those recommendations coming!) So not much of a event-previewing Friday Quickie today given how busy I'm packing and prepping my itinerary, so instead I'll point you to some of my favorite weekend guides / event calendars that my cool cat pals compile! Caroline on Crack - not just food/drinks, but also good intel on clothing/accessory sales and noteworthy performances too! 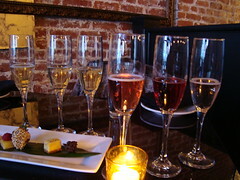 Eat:LA - covering foodie events all over LA, nice place to check no matter which 'hood you're at. FoodGPS's Beer Blast - not weekend specific, but this is a must-subscribe for any LA/OC beer enthusiast. Every week you'll get the lowdown on what the local top-notch beer joints are rotating in and out of their taps and stocks. DigLounge - good highlights of upcoming festivals and tasting events, as well as music shows. TastingTable LA - much more food- and drink-centric than the weekend calendars of the other daily e-newsletters; a great source to find out about new openings, tasty events, as well as debuting deals & steals. Last but not least Social Domain LA - OK, again, not weekend specific but the Craigslist-like simplicity of its layout makes it very easy for me to spot and look into upcoming events. With that, hope you'll find some fun new to-dos. I know my weekend in Frisco will be eventful for sure! And got any of your own favorite weekend guides to share? Feel free to leave a comment and let me know! A Satisfying Seafoody Saturday . . .